We’re proud members of The Camping and Caravanning Club and are part of the Club’s Preferred Dealer scheme in the South West. 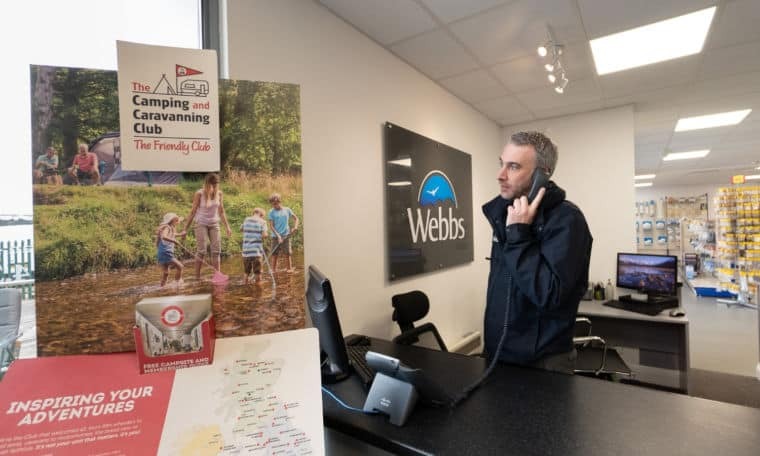 At Webbs we have joined forces with The Camping and Caravanning Club as part of their Preferred Dealer scheme in the South West. This new initiative, which launched in February 2016, was established to give Club members access to a trusted and reputable network of dealers throughout the UK. You’ll find us listed as a Preferred Dealer on the Club website: www.myccc.co.uk/preferreddealer. Club members will also hear more about Webbs and the wider scheme in the Club’s e-newsletters, advertising, and in the Club magazine and online publications. The Club chose to work with us because of our strong reputation for high quality customer service, and our willingness to offer Club members exclusive and meaningful offers throughout the year. The Camping and Caravanning Club was founded in 1901 and today represents more than 600,000 campers, caravanners and motorhomers, so you’ll be in great company. Special camping rates for over 60s and families on Club SitesPlus much more! View Webbs profile on The Camping and Caravanning Club website.